A year after a then-ETSU student counter-protested in a gorilla mask during a Black Lives Matter demonstration on ETSU’s campus, flyers for a white supremacist group were found at ETSU. 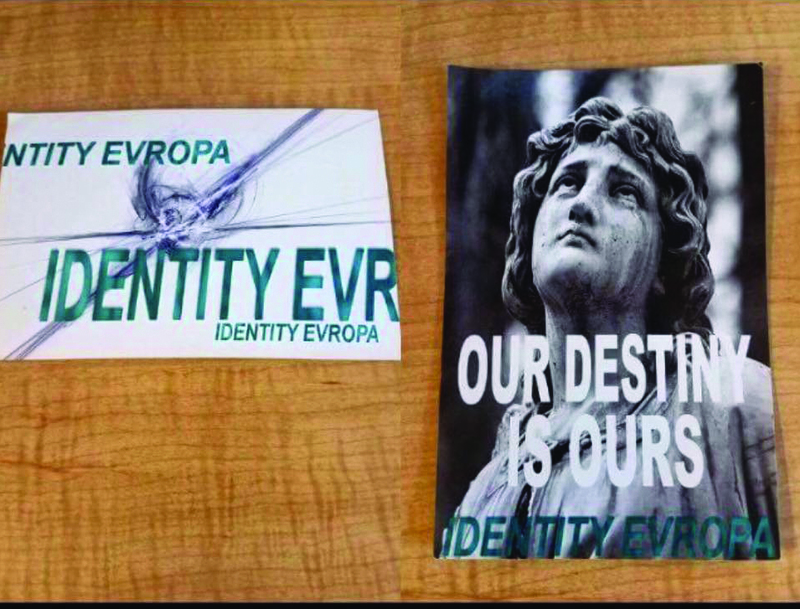 An ETSU student found flyers on Oct. 5 for Identity Evropa, a white supremacist group based out of California. A copy of the fliers found on campus. Executive Assistant to the President for University Relations Joe Smith said university officials will continue to monitor the situation. The posters were put up without ETSU’s permission and are not listed as an official ETSU organization. Identity Evropa does not label itself as a white supremacist group. Nathan Damigo started the organization in 2016 for “a better future for people of European heritage,” according to his website, nathandamigo.com. The organization has over 21,000 Twitter followers. The organization’s Twitter account has been sharing photos of its flyers on college campuses across the country. The campaign is called #ProjectSiege, and it was started in August 2016. So far, no post has been made on the official site about the flyers on ETSU’s campus. Middle Tennessee State University also had unauthorized Identity Evropa flyers placed on the campus Oct. 2. While most flyers placed on college campuses have been discreetly placed in areas amongst other public flyers, some have been on telephones, the sides of buildings and inside books. Photos from New York University show flyers being placed in lockers. ETSU has an approval policy for any posters displayed in the D.P. Culp University Center, which involves a stamp of approval. Materials placed on Culp Center bulletin boards must have the name of the individual or organization and a means for contact. Because the posters were not submitted for approval, there is no contact or way to identify whether a member of Identity Evropa or a student hung the flyers.